You are invited to attend HCC’ s bi-annual Asia Panel which will be held in 2 weeks time. Our special panel of speakers will focus on “Australasian leadership” and explore the importance of the cultural diversity element, that currently seems amiss across politics, media and business. 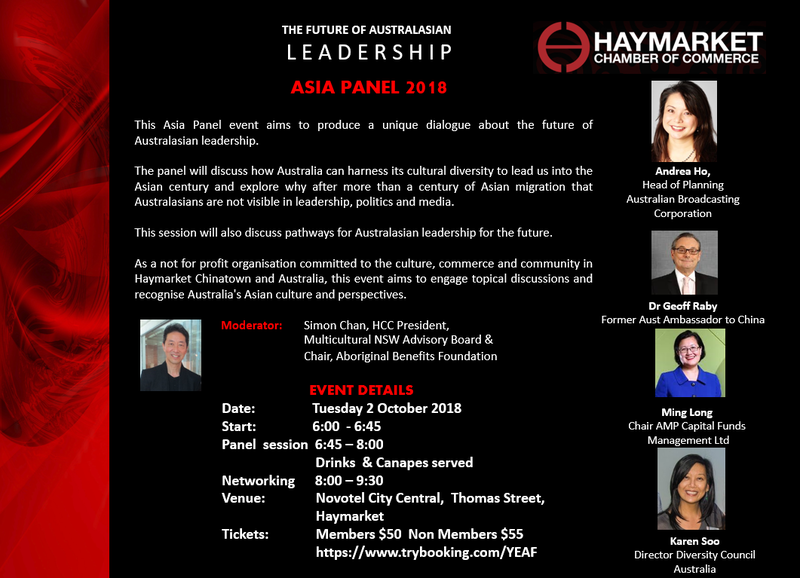 The panel will be moderated by HCC President Simon Chan and our speakers include Andrea Ho, representing Michelle Guthrie, CEO at Australian Broadcasting Australia; Dr Geoff Raby, Former Australian Diplomat to China; Ming Long, Chair of AMP Capital Funds and Karen Soo, Director, Diversity Council Australia. So, join in us for an engaging evening and the opportunity to network with a broad range of businesses and individuals.